The trial of IPOB leader, Nnamdi Kanu commenced today and according to details of the proceedings surfacing on net, it has turned more interesting than what it was before. Justice Binta Nyako of the Federal High Court in Abuja on Tuesday ordered Senator Eyninnaya Abaribe, and two others standing as sureties for the leader of the proscribed Indigenous People of Biafra, Nnamdi Kanu, to explain the IPOB leader’s whereabouts. The Senator representing Abia South Senatorial district, Enyinaya Abaribe, has applied to the court to discharge him from the suretyship, bond and recognizance of the bail of the leader of the Indigenous People of Biafra (IPOB), Nnamdi Kanu. In an application seen by NAIJ.com and filed against the federal government, Nnamdi Kanu and his co-defendants, Abaribe is asking the court to make an order discharging him as surety of the first defendant - Kanu. 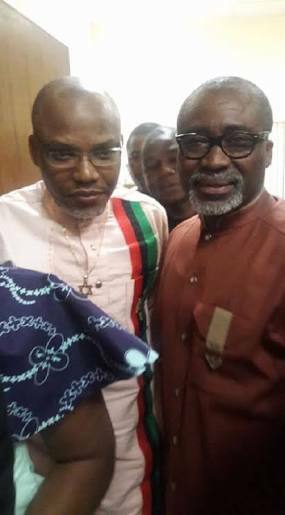 Abaribe prayed the court to discharge him entirely from the incidence relating to the bail of Kanu. He is also asking for a discharge of the bond used for Kanu's bail and a refund of N100 million or any other bond paid to the court sequel to the bail. The grounds upon which Abaribe sought the reliefs include that the Nigerian army during a raid at the residence of the IPOB leader engaged in a fracas with members of the group which has been proscribed by the federal government. "Since the afore stated visit of the Nigerian army to the residence of the first defendant from September 11, 2017, the second respondent in this suit has not been seen again nor reached on phone bu the applicant neither is he reported in any news media as seen by any person nor made any statement on any issue." The senator said since September 20, the report in the media is that the first respondent (Federal government ) has proscribed IPOB an organisation led by Kanu and declared the organisation a terrorist organisation. He said security agencies of the federal government are interested in the second respondent. "The apllicant lacks capacity to produce a person stated by the first respondent to be ma member of a terrorist organization or any person who the first respondent is reported to be interested in his whereabouts in the aftermath of the military operation in Abia state," Abaribe said in his application," he said.